Caption TLALOC Lord of all sources of water clouds rain lightning mountain springs and weather. Tlaloc was pictured as a man wearing a net of clouds a crown of heron feathers foam sandals and carrying rattles to make thunder. The consort of the water goddess Chalchiuhtlicue and sometimes regarded as the father of the moon-god Tecciztecatl. 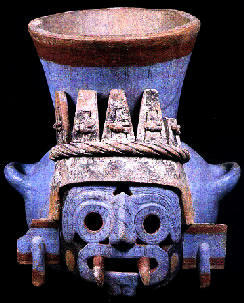 .. TLALOC Polychromed ceramic vessel from the Great Temple of Tenochtitlan Mexico depicting the rain god Tlaloc. Museo del Templo Mayor Mexico.